When you go grocery shopping, you probably also do your shopping for items like toiletries and other household items at the same time. You can add these items directly to your Real Plans Shopping List to have everything you need on one list. You can even schedule these items to be purchased at regular intervals. If you have staples that you buy regularly or want to add some healthy snacks to be purchased every month, you can do it all straight from the Shopping List. From your Meal Planner, click on “Shopping List”. Look for “Add Ingredient/Item” next to “Actions” in the upper right corner. 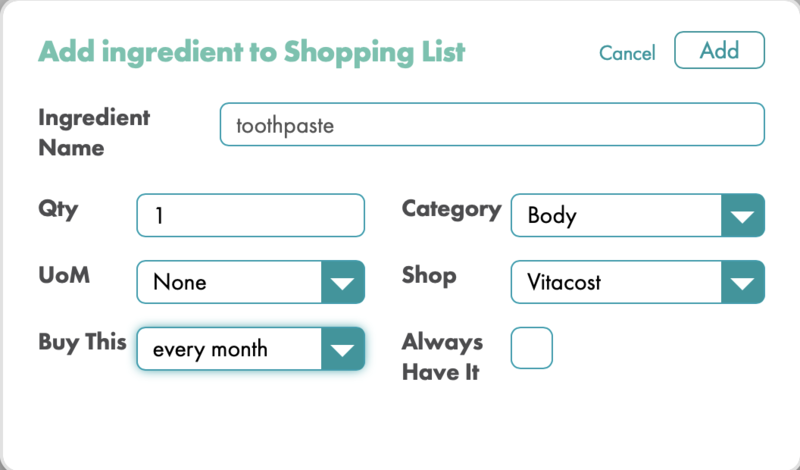 Type the name of the ingredient or item you wish to add to your shopping list and click . Choose the quantity you need, preferred unit of measure, the category of the item, where you wish to purchase this item, and how often you wish to purchase it. Click “Add”, and this item will now appear on your Shopping List. If you want to add an item as a one-time purchase and do not wish to schedule it to be bought on a regular basis, select “Not Scheduled” from the “Buy This” dropdown. This item will appear on your Shopping List for the selected week but will not appear again unless you add it again or schedule it. Scheduling items to be purchased at regular intervals will help ensure that you won’t run out and will also save you time by keeping you from having to add them to your list every time you need them. It can also save you money by keeping you from running to the store for just a few items and ending up buying more than you intended. If an item you scheduled is on your shopping list, but you don’t need it this week, simply check the box that you have it and refresh your Shopping List by clicking in the upper left. To remove the item completely, click next to the item you wish to remove. Doing this will remove it from your scheduled ingredients list, so only click if you do not want this item to show up on your Shopping List again. 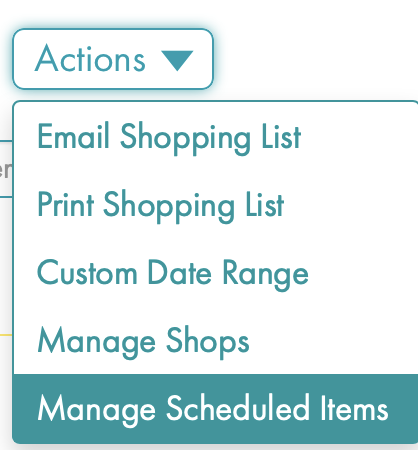 To manage your scheduled Shopping List items, go to “Actions” in the upper right corner and select “Manage Scheduled Item” from the dropdown menu. You will see a list of the items you have added to your Shopping List to be purchased at regular intervals. Click on to edit the item, such as changing the quantity you need to purchase or how often you wish to buy it. Click on to remove the item from your scheduled items list. It will not show up again unless you add it back. You can schedule more items to be purchased regularly here by typing them in the box and clicking . Be sure to click on “Add” to add these items to your Shopping List. 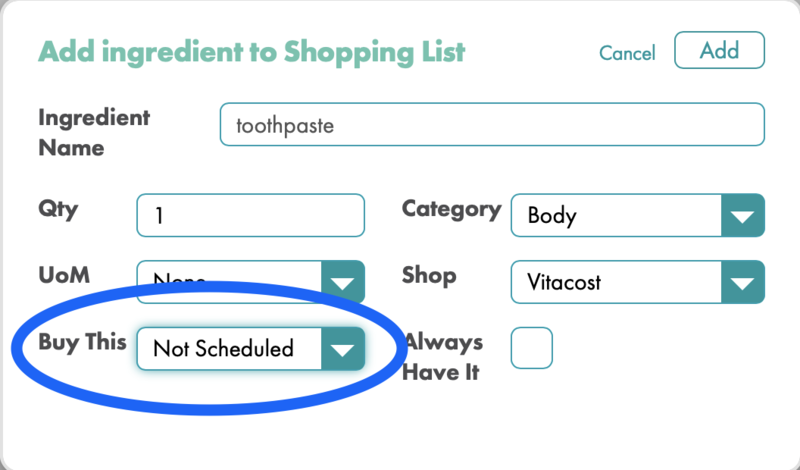 Click “Close” when finished to exit the Scheduled Ingredients window and go back to your Shopping List.